This type of motorcycles clutch is designed for dual clutch transmissions composed of two hydraulic clutches operating separately for odd and even gears. 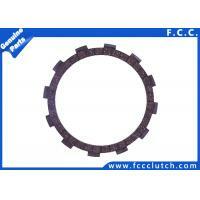 The friction materials selected for their ideal properties for hydraulic clutches produce seamless gear changes. The advantage of these compact, lightweight clutches with an aluminum cam construction can reduce lever control force and the back torque caused by sudden engine braking. Wet-type centrifugal clutches is designed to capture the centrifugal force from engine rotation, these starting clutches have found use in a wide variety of vehicles, from compact vehicles for business use to large model ATVs. As devices for harnessing the centrifugal force of engine rotation, these starting clutches for belt converters are used in scooters, covering the complete range of sizes. Driving and driven pulleys transmit precise engine torque to belts in scooters ranging in size from 50 cc to 650 cc. Zuzuki Model: GS125, GSX-R600, GN125H, GN150, 110cc, GSR125, etc.